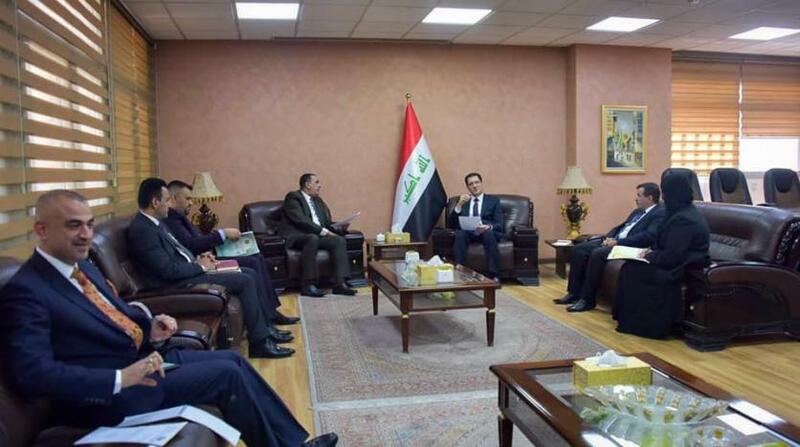 The Minister of Planning, Dr. Nouri Sabah al-Dulaimi, received on Tuesday, Mr. Rakan al-Jubouri, Governor of Kirkuk and his accompanying delegation, during the meeting discussed the service reality of Kirkuk province and the possible ways to improve it. Dr. Nuri al-Dulaimi directed the ministry's formations in Kirkuk governorate to coordinate the monitoring role with the local government to follow up the stages of implementation of the service and investment projects in the governorate, securing the payment of previous dues to the contractors and farmers and unifying all efforts to achieve spatial development and sustainable development within the ministry's vision for Iraq 2030. For his part, Mr. Rakan Jubouri expressed his sincere appreciation for the directives of the Minister of Planning in support of the province, stressing the work of the local government to translate this support to service projects will touch the impact of the citizen this year.